Last Sunday ETU-MB members and many Korean students marched from a Park downtown Seoul through the city to Myeongdong cathedral to push the demands for abolish Industrial Trainee System, against the planned EPS (see our article 諛�igrant Worker萸� Struggle Against Crackdown��), to achieve working visa and full human and labor rights. 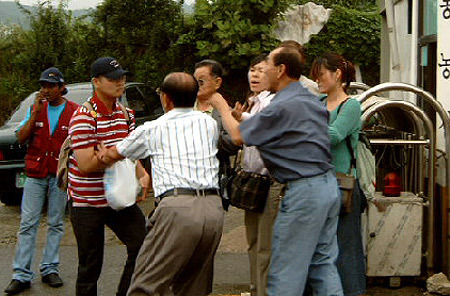 Last Tuesday in Pyoengnae near Maseok (Gyeonggi-do/province) in Unique Daesung Co. Ltd. a migrant worker were attacked by Korean foreman. The story: Selim Mullah, a Bangladeshi, told his Korean foreman ?he sees himself a bit like little manager ?that he felt sick and had pain on the back, therefore he couldn�t work on that day. The foreman wanted to force him to work. Selim refused and the foreman started to attack him and beat him in the face. As a result Selim had to go to hospital and got stitched over the left eye. This was happen in the morning. 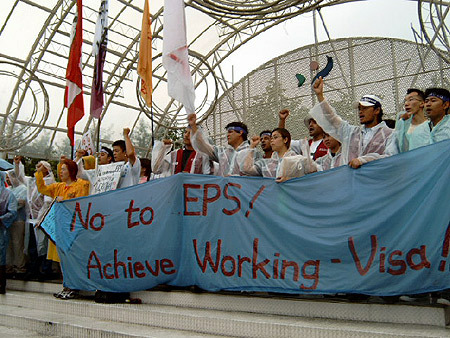 After lunch all (38 from total 140 workers, another 38 are Filipino workers) Bangladeshi workers decided to go on strike after contacting ETU-MB (Equality Trade Union ?Migrant�s Branch). After the arrival of ETU-MB staff there they got immediately in negotiations with the main manager of the factory. After a while the manager got a written permission from the owner of the factory to negotiate with the union. From 7.30 pm they started to bargain. After hard negotiations at 9.30 they�d the result: The factory pays all costs for Selim�s medical treatments. The factory gives him free until he recovered and the factory will give the full payment during the days. The foreman will be dismissed. The main manager will apologize in front of all workers. The union will get the right to rally in front of the factory for the next two month. The union will get the right to educate the management about how to treat migrant workers. And last but not least last Saturday the management and ETU-MB started to negotiate about working conditions for migrant workers in the factory. After all: a victory for migrant workers and the union. Of course it only was happen because of the strong unity among the Bangladeshi workers! That led them to the idea to take a visit in the house of Filipino migrant workers. They had heard before about the incident, but also about the reaction of Bangladeshi ?to go on strike. Never they thought something like that could be happen in �their?factory. ETU-MB staff told them about the result of the negotiation with the main manager and that this could be happen only because of the strong unity of Bangladeshi workers. But, they told them, if they would be a part of the strike, perhaps, much more faster they would got the result. Last Thursday Filipino migrant workers invited ETU-MB members to learn more about the negotiations between the union and the management and about ETU-MB in general. After long and intensive discussions about the necessity of unionized organization the Filipino workers decided to join the union on Saturday�s bargaining. Saturday�s negotiation about union�s demands was in some cases successful, because the management recognized ETU-MB�s demands. 5. The management should pay �Bonus payment? Even the management accepted the demands they refused to sign an arrangement with ETU-MB, because, they said, they need some time to think over. But two days later ETU-MB had to found out that this only was a trick to win some time. The truth is that in the reality the management doesn�t want to bargain with ETU-MB, instead they want to create one own factory union ?of course a yellow one. But, and here it comes, they forgot ?or they didn�t know - that in Korean law only one union in one factory can represent the workers. And still there exist one union in Unique Daesong Co. ?the ETU-MB. So, on Tuesday they will be forced to continue the negotiations with the union. 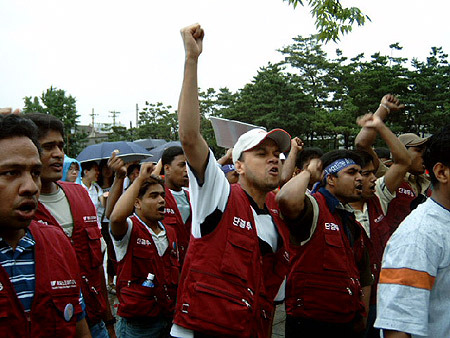 Last Sunday ETU-MB members and many Korean students marched from a Park downtown Seoul through the city to Myeongdong cathedral to push the demands for abolish Industrial Trainee System, against the planned EPS (see our article �Migrant Worker�s Struggle Against Crackdown��), to achieve working visa and full human and labor rights. The next protest rally will be held on Thursday, July 31st on Yeouido in front of the National Assembly, where on this day South Korean Parliament will vote over the introduction of EPS. ...striking migrant workers accepted the result.